I’m a massive fan of gyozas, so much so that I own three gyozas presses, have written my own published recipes for them, and have spent an excruciating five minutes in a ramen joint in Tokyo trying to work out how to pronounce the word properly so I could order some from the waitress (disclaimer: I still don’t know. But I just pointed in the end!). 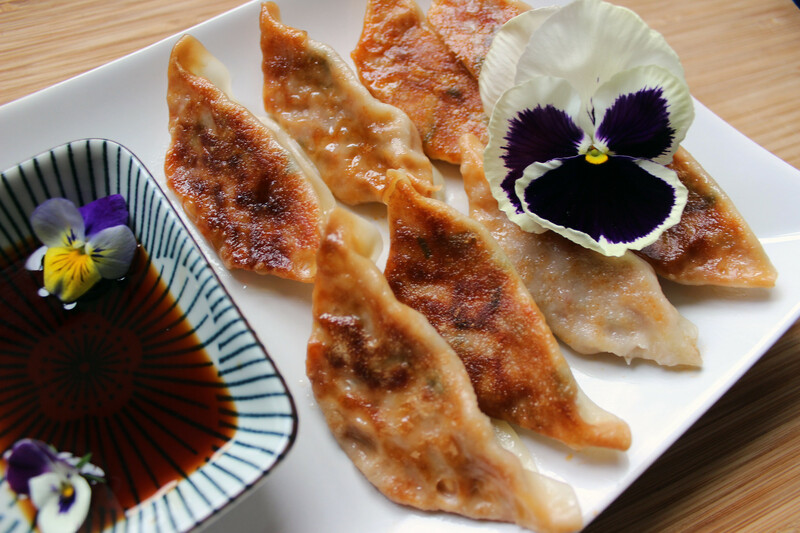 Although gyozas aren’t exactly the mysterious food item for UK consumers that they used to be ten years ago, you’d still be hard-pressed to find any ready-made in supermarkets outside of Asian speciality stores. 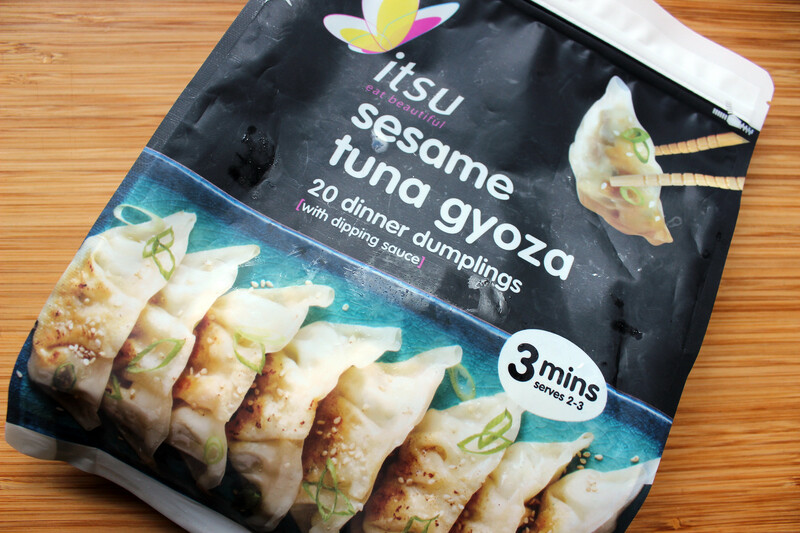 That’s why I was so excited when I found out that Itsu were launching their own cook at home gyozas, ready frozen and available in Tesco and Waitrose in three flavours: Vegetable Fusion, King Prawn and Sesame Tuna. The packets cost £3.50 per pack and contain 20 dumplings, and dipping sauce. You can boil, pan-cook or microwave these in around five minutes, or you can steam-fry them in the classic way (add oil, fry until browned on the base, add water to the pan and steam until evaporated, then fry again until crisp). I love to serve these simply with the dipping sauce and some edible flowers from the garden – you can have them with rice as a main course, or as a starter for a larger meal like teriyaki salmon. Or, they’d make a lovely light lunch! As you may have already gathered, traditionally in Japan they’re served with ramen, because they’re actually considered to be a Chinese dish, along with the big hearty bowl of broth and noodles. Itsu provided me with this recipe for a veggie-packed ramen fusion dish to make at home, so I thought I’d share it with you! 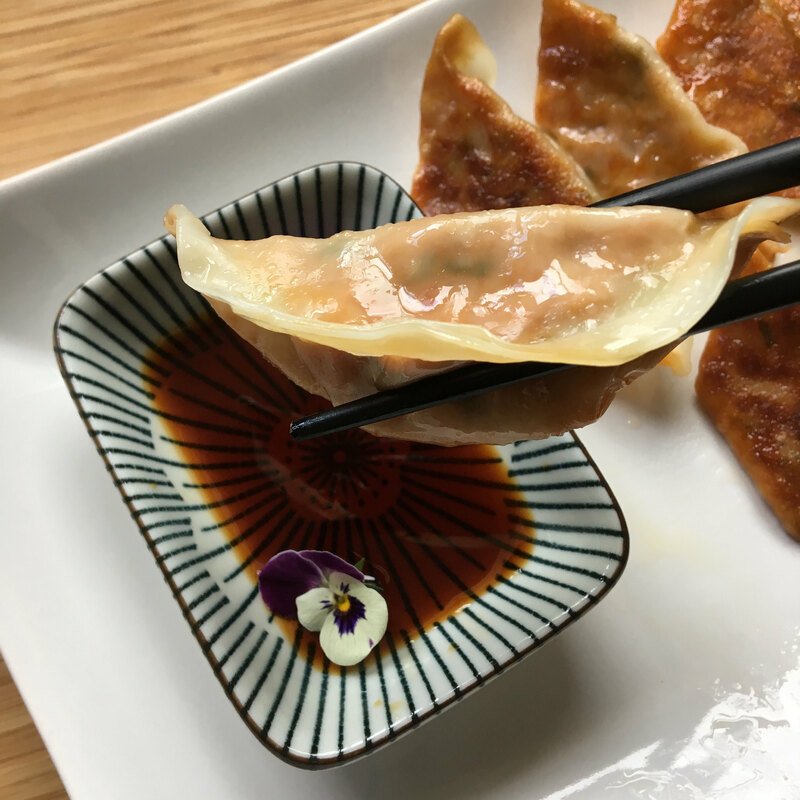 *sub for any flavour of gyozas you’d prefer! vinegar and simmer for 10 minutes. Strain the ramen stock through a fine sieve, discard the ginger and garlic and pour back into the saucepan. Bring the ramen back to a gentle simmer, add the gyoza and simmer for 3 minutes. Lift the gyoza out of the ramen into a serving bowl. Add the pre-cooked noodles, carrot ribbons, bean sprouts and mange tout to the ramen broth and cook for a further 2 minutes. Ladle the ramen broth & vegetables over the gyoza and sprinkle with chives. Let me know if you make it! It’s packed full of good things, and a fantastic way to enjoy these gorgeous little parcels of flavour at home!